Happy Valentine's Day! I hope everyone was able to spend time with those they love the most. It was a very low key day in our household, but very nice nonetheless. It's hard to imagine that 6 years ago, I would be going on my first date with my future husband. I remember going to dinner and splitting a wonderful blueberry cobbler for dessert (he's lucky he didn't pass up dessert), then heading off to a movie. These have been on top of my list of things to make for over a year now, and I finally got a chance to a week ago. 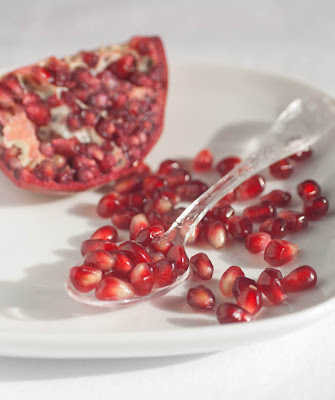 However, I think they are so pretty and would make a wonderful, understated dessert for Valentine's Day. These verrines, a layered dessert usually presented in a small glass, were delicious. Tart, smooth, and balanced. They made for a great breakfast the next day as well...hey, they're yogurt! Add the cold water to a small bowl and sprinkle powdered gelatin over it and set aside. Meanwhile, add the tea, juice, sugar, and lemon zest in a medium saucepan and heat over medium heat until the sugar is dissolved. Remove from heat and add gelatin mixture and stir until completely dissolved. Let mixture cool to room temperature. Divide mixture among glasses and refrigerate for about 2 hours until set. If desired, position the glasses at an angle in an empty egg carton to set at an angle. 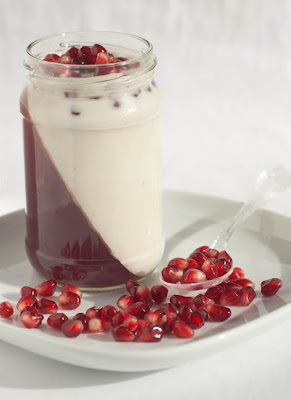 In a bowl, combine 1 cup yogurt, the honey and the ginger and mix until combined. Set aside. In a small bowl, sprinkle gelatin over cold water and set aside. In another bowl, heat the remaining yogurt in the microwave for one minute. Then heat the gelatin mixture in the microwave for 12 seconds. Mix the melted gelatin into the hot yogurt mixture and stir until well combined. Add the gelatin and yogurt mixture to the yogurt-honey-ginger mixture and combine. 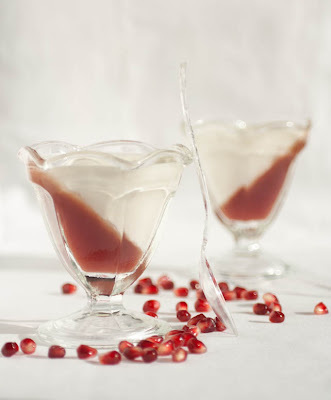 Spoon the yogurt gelee over the pomegranate white tea jelly and refrigerate at least 2 hours or until set before serving. these look amazing! and you're right, a great Valentines treat :) next time i've got a kitchen I definitely want to try them!